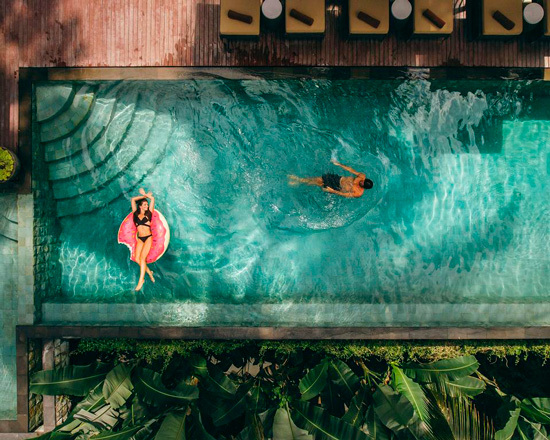 This is the list of the most beautiful and relatively inexpensive hotels with gorgeous infinity pools right in the middle of tropical jungles or rice terraces. 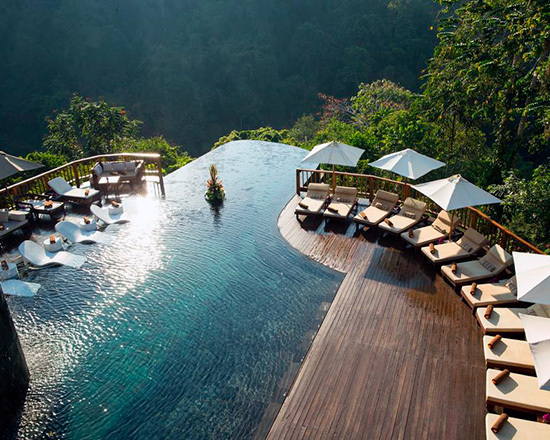 * Infinity pools – is a pool, where the water flows over the edges, producing a visual effect of water with no boundary. 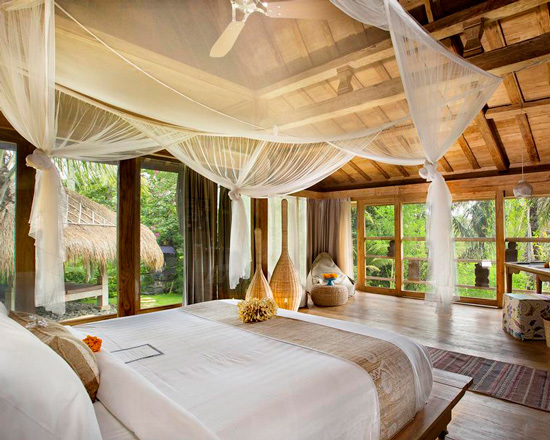 Spa Pita Maha Resort & SPA is located on a natural landscape with a magnificent scenery of Campuhan river. The restaurant overlooks the gorge, and the food is prepared with products (fresh fruit, vegetables and seasonings) grown in the hotel's local garden. Ponds with Lotus flowers, beautiful gardens and well- kept trees... the atmosphere of love and friendship is cherished here. 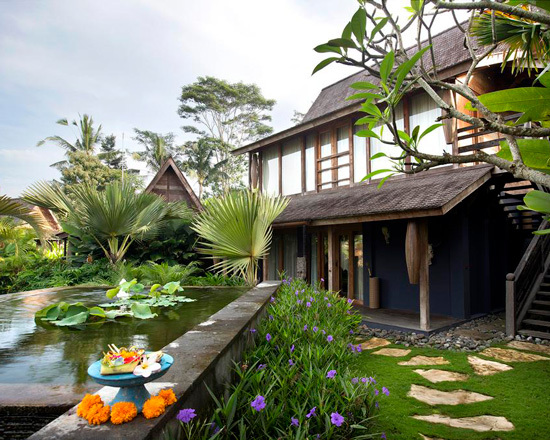 Within walking distance from the hotel there are: Gaya Art Space, Neka art Museum, Blanco Museum, Museum Puri Lukisan (Palace of paintings), the Pura Taman Saraswati and Botanic Ubud garden. Price: about $200 Check the hotel at booking.com. 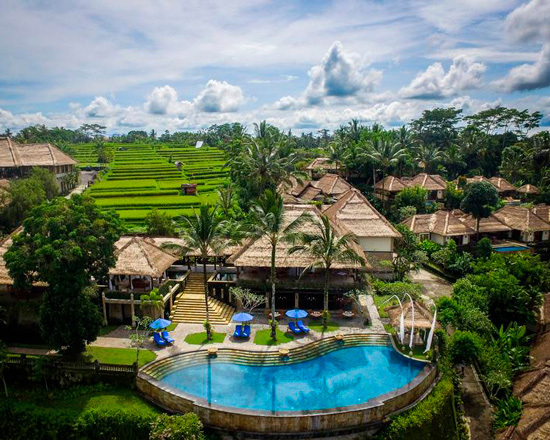 A picturesque Puri Wulandari - a Boutique Resort & Spa hotel is located in the heart of jungles and attracts tourists with its calm, tranquil atmosphere and large territory. You can move on a buggy on the vast territory of the hotel. 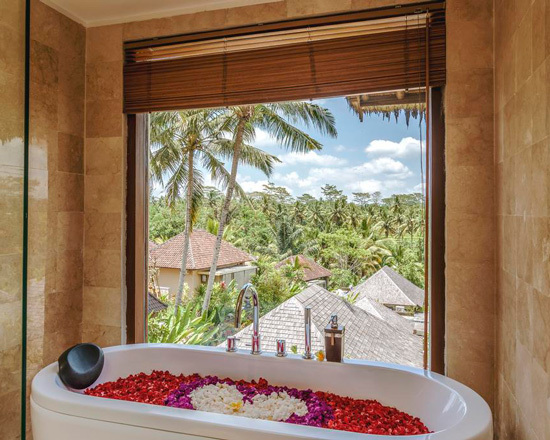 A surrounding beautiful natural landscape and convenient location within close distance to attractions such as Lobong Culinary Experience, Alila Ubud Gallery, Kuluk Gallery makes this hotel really appealing. Price: about $280 Check the hotel at booking.com. 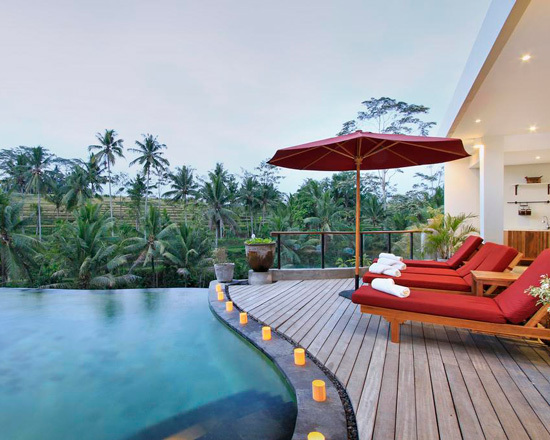 Puri Sebali Resort is a hotel with stunning views of rice terraces from the infinity pool. 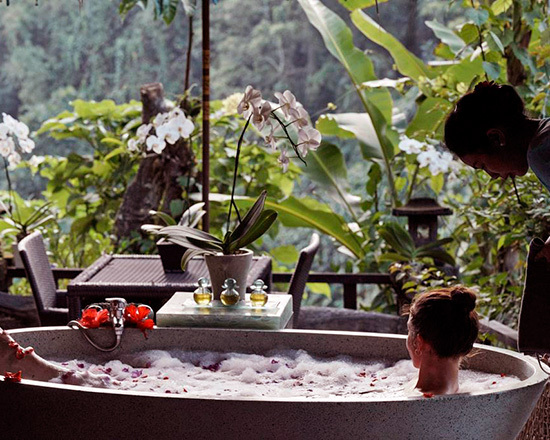 The hotel is located within walking distance from Ubud Botanical garden and within 20-minute drive from the Monkey Forest. 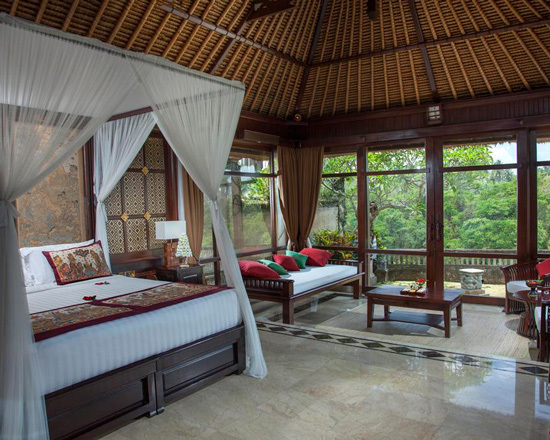 This nice and cozy hotel will make you enjoy the unity with nature and make your stay unforgettable. Price: only about $100 Check the hotel at booking.com. 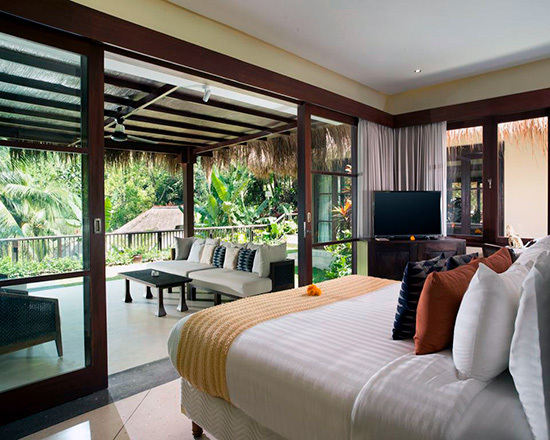 From Blue Karma Resort rooms you can contemplate the beauty of tropical gardens and enjoy the atmosphere of delightful tranquillity and liberty without getting up from your bed. 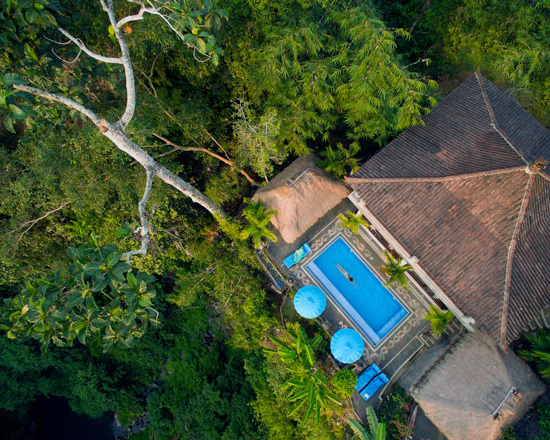 Infinity pool overlooking the jungle will allow you to immerse yourself in peace and relaxation. The hotel offers an excellent price and quality relationship. 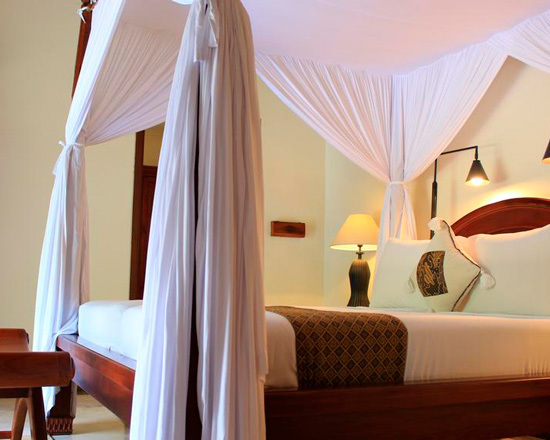 Wapa di Ume Resort & Spa has a very convenient location - 5-minute drive from Ubud center. 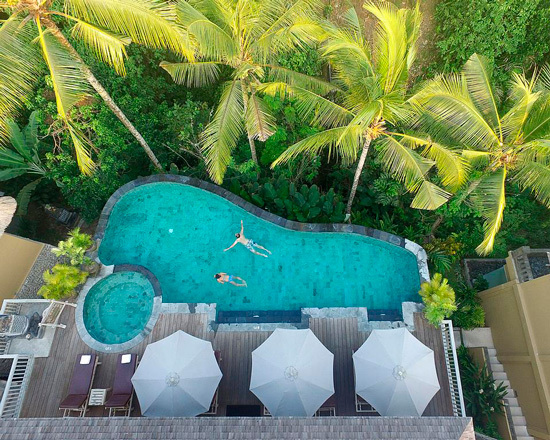 It offers traditional Balinese villas overlooking rice terraces, a few cascading pools, and of course a fascinating view of tropical jungles from the infinity pool. 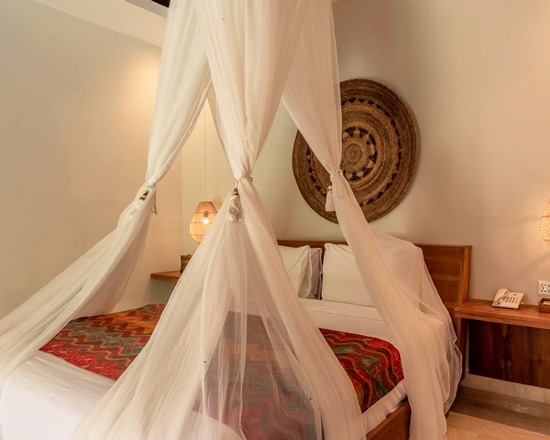 Within walking distance from the hotel there are Ubud Botanical garden, Seniwati Gallery of Art by Women, Museum Puri Lukisan (Palace of paintings), Pura Taman Saraswati, Ubud Royal Palace and Ubud Market. Price: about $150 Check the hotel at booking.com. 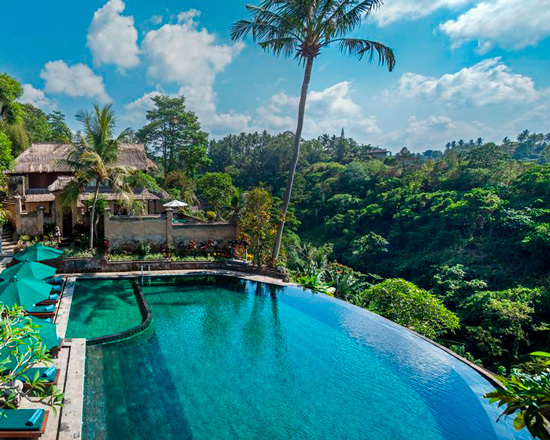 This Villa does not have an infinity pool, but because of its incredible atmosphere we still want to add it to the list. 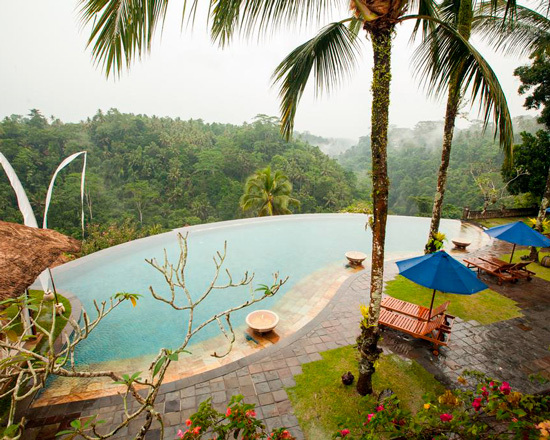 Kalisat is located in the traditional Balinese village on the hillside of Petanu river gorge. 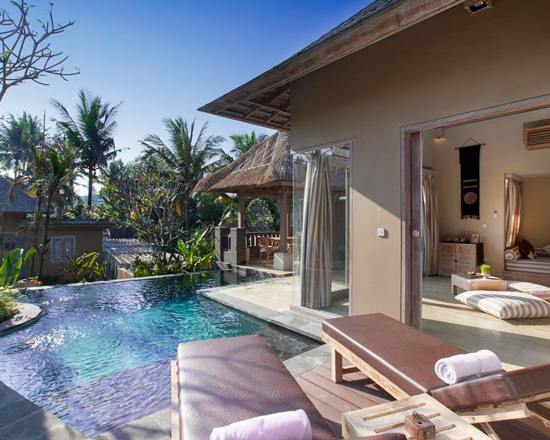 The Villa offers a panorama lounge, 2 outdoor pools and a private Spa. 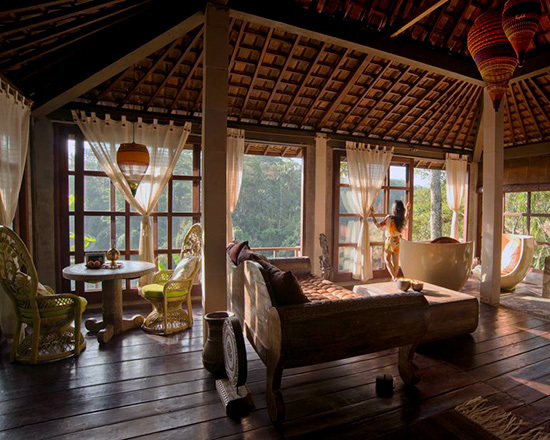 It is a lovely and charming hotel in the middle of a wild and unexplored Balinese jungle. 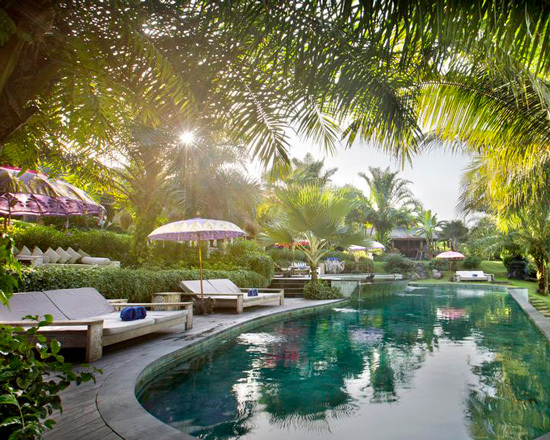 It is a kind of pioneer among the infinity pools in the jungle. 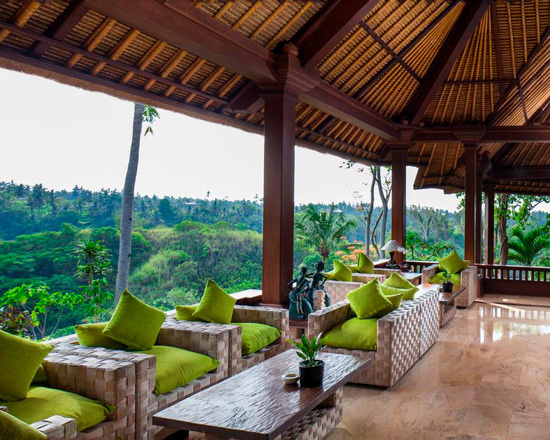 Its curves resemble Balinese rice terraces and perhaps that is why it looks so harmonious. Price: about $500 Check the hotel at booking.com.